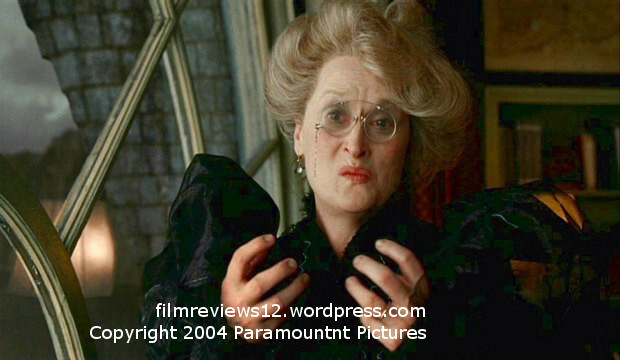 As you can see, Meryl Streep’s character likes to eat things that aren’t there. This, I imagine, is what supermodels have done for decades. If this makes sense, it’s worth noting that Lemony Snicket’s A Series of Unfortunate Events is almost cheerfully gloomy, in the kind of worlds that Roald Dahl would create or a film by Tim Burton. I have not read any of the books of which this film is based on, which apparently are written under the name Lemony Snicket, but I can deduce that this is a good adaptation, as a stranger such as myself had no trouble deciphering anything. This is the story of the Baudelaire children, Violet (EMILY BROWNING, who, writing this in 2013, I must say bears a startling resemblance to Jennifer Lawrence here), 14, a resourceful inventor-type, Klaus (LIAM AIKEN), a bookish type a couple of years younger, and Sunny (KARA and SHELBY HOFFMAN) a toddler whose main purpose is to provide subtitled babbling wisecracks and to bite things. 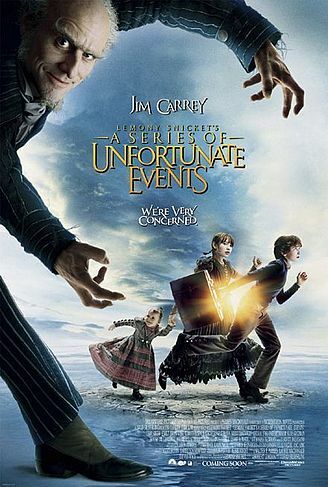 Mr. and Mrs. Baudelaire are presumed dead after a massive fire destroys their house, and following which they are sent to live with eccentric relatives they were previously unfamiliar with, all interspersed with the appearance of a Count Olaf (JIM CARREY). What do I mean? The childrens’ meeting of the reptile loving Uncle Monty (BILLY CONNOLLY) and the hard-to-explain Aunt Josephine (MERYL STREEP) are all interrupted by Count Olaf. I mean, sure, when you look over the names of the adults, it would appear that this would be compensation for adults attending this film with their children. (Close to the end, there’s a brief appearance from Dustin Hoffman, too). And the next conclusion would be that the actors know that, and perhaps refrain from giving it 100%. No. I am happy to report that the acting is great, all down the board, including the kids (well, I mean the performances of the ones that were old enough to have speaking lines. The baby in this movie didn’t have an awful lot to do). But on the other side of things, I’ve never really been much of a Jim Carrey fan, so it took me a while to become accepting of his naturally over-the-top performance of a character clearly written that away. The visual style is attractive. Filmed in darker colors with an intentionally ludicrous set design, it’s strangely entrancing at times. Director Brad Siberling uses the talent of the art and visual effects teams to put together a truly amazing looking movie. But there is not all good here. When this movie is getting started, it begins to over-saturate itself with so much material you feel the thing starting to implode – joke here, visual quirk there, special effect there… really, that kind of oppression never really leaves, it just becomes less noticeable. However, Lemony Snicket’s A Series of Unfortunate Events is an unquestionably entertaining movie, working with all the staples of an adaptation and also working for those completely unfamiliar with its source material.